Discovering new tricks to help kids stay on task never stops. Not for teachers who strive to stay current in our amazing world. That’s why I’m introducing a new series to supplement my weekly Monday blog on Attention-ology. Starting today, Mid-Week Focus will appear (before your very eyes) on Wednesdays. Mid-week Focus is all about quick and easy ways to approach teaching. Let’s share some insight on how to connect with kids and practical ideas to inspire them to achieve. Let’s help them stay focused on learning, as we work together in a world community of educators. Creative thinking is like magic to me. Ideas for helping kids learn seem to pop into my mind wherever I go – even at our neighborhood pool! Did you know that research shows that water somehow triggers creativity? I’ve written a number of poems after swimming – true story! One place that always inspires me is a library or media center. It’s magical! A media center is a lens into the wide, wide world. A library offers a magical window to the world! 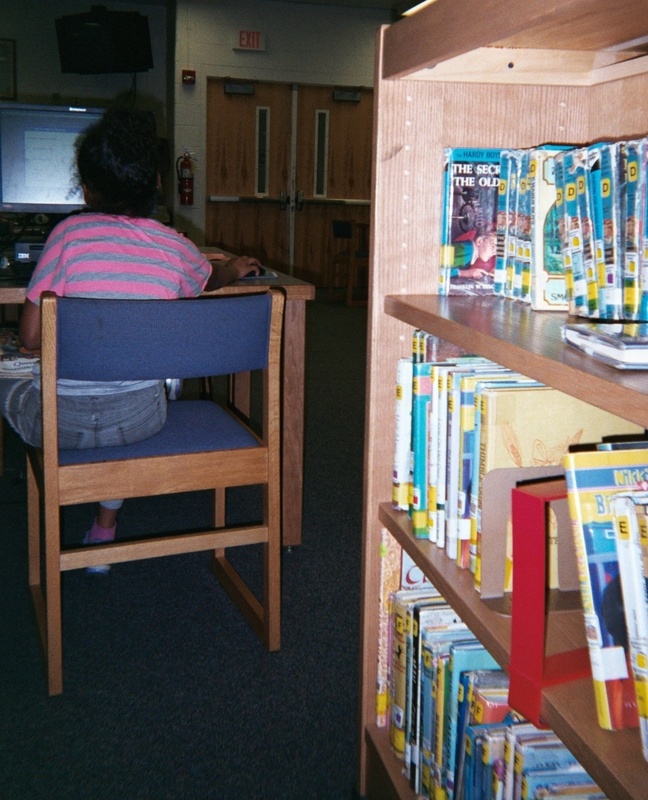 No question, being able to access the Internet in a media center, like the girl in my blog pic here, adds to the magic. A child who doesn’t have access to the Internet at home especially benefits from a librarian’s or teacher’s guidance in a media center. Ever enjoy listening to kids talk (hopefully in quiet voices) in a library as they search for a book to borrow? I do. I like to pick up ideas for teaching by noting interests that children express as they buzz about like bees. Monitoring trends is key to staying current. Books on display usually connect with the current season. Visit my April post about a librarian who catches kids’ attention by sprinkling seasonal rewards. New books have a wonderful smell. Old books have a special feel. Sometimes when I borrow an old book, like Rudyard Kipling’s Just So Stories, the librarian will sigh and say, “No one has bothered with this book for a very long time!” Let’s not forget to use old treasures to teach. Stop by next Wednesday for more Mid-Week Focus. On Monday, Attention-ology will feature more tools for teaching good character traits.